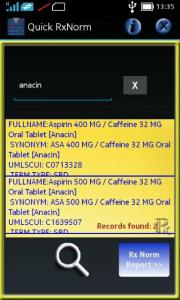 Search for and get, Share and generate report of Full RxNorm Name, RxNorm Synonym, UMLSCUI Code and Attribute TTY Based on National Library of Medicine data. 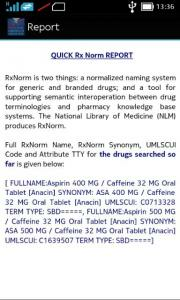 RxNorm is two things: a normalized naming system for generic and branded drugs; and a tool for supporting semantic interoperation between drug terminologies and pharmacy knowledge base systems. The National Library of Medicine (NLM) produces RxNorm. Hospitals, pharmacies, and other organizations use computer systems to record and process drug information. Because these systems use many different sets of drug names, it can be difficult for one system to communicate with another. To address this challenge, RxNorm provides normalized names and unique identifiers for medicines and drugs. The goal of RxNorm is to allow computer systems to communicate drug-related information efficiently and unambiguously.